Size:155 x 235 mm, 6.1 x 9.3 inches. From Naaukeurige Versameling der Gedenk-Waardigste Zee en Land-Reysen (a seies of accounts of famous voyages). A map of Japan and Korea. In the lower right is a fine title cartouche showing William Adams during an audience with the shogun, who sits under a baldachin on a fancifully portrayed throne. 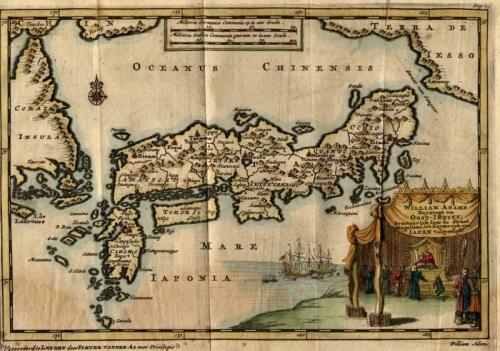 William Adams came to Japan in 1600 as the pilot of the first Dutch ship to arrive there. He was taken into the service of the shogun and died in Hirado in 1620, without having returned to Europe. Pieter van der Aa is highly thought of for the design and quality of his output and was a prolific publisher. The map has a good and dark impression with a very decorative title cartouche. The left margin has been cut close and the paper is slightly age-toned. First state and generally in very good condition.